I have a ton of toys / figurines but my most favourite are the ones from the movies made by Tim Burton. There was bad lightning today and I didn’t want my computer to get hit so I unplugged it and decided to shoot photographs instead. 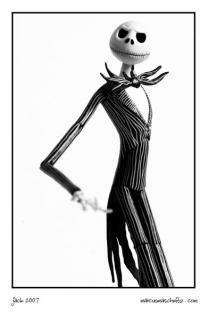 This one is a portrait of Jack Skellington. I LOVE JACK!! And Tim Burton is a genious!